This year, the largest increases have occurred in China, driven by government stimulus of the construction industry. U.S. emissions have also increased markedly in 2018, after an unusually cold winter and hot summer helped to drive up energy demand. The figure below shows global CO2 emissions from fossil fuels, divided into emissions from China (red shading), India (yellow), the U.S. (bright blue), EU (dark blue) and the remainder of the world (grey). 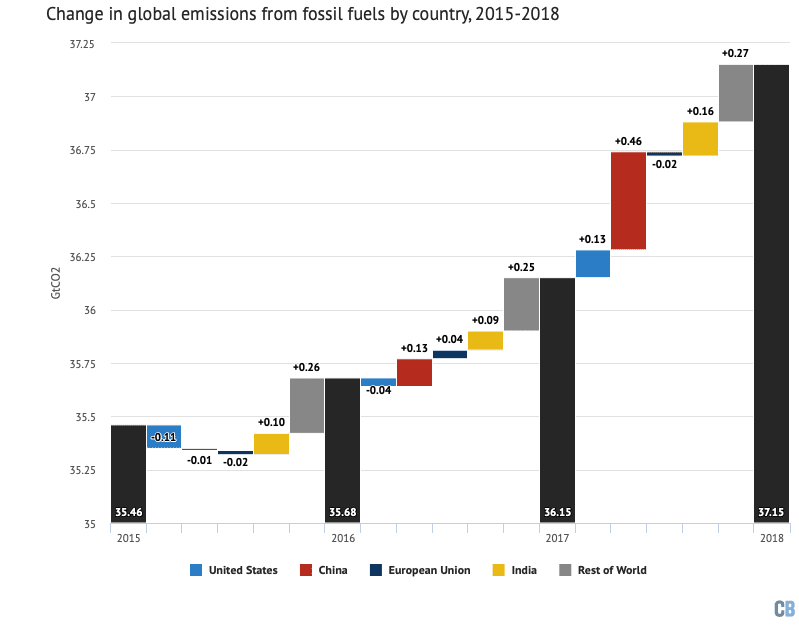 Emissions are expected to rise to a new high of 37.15bn tonnes of CO2 (GtCO2) in 2018, with China and the U.S. as the two largest emitters. 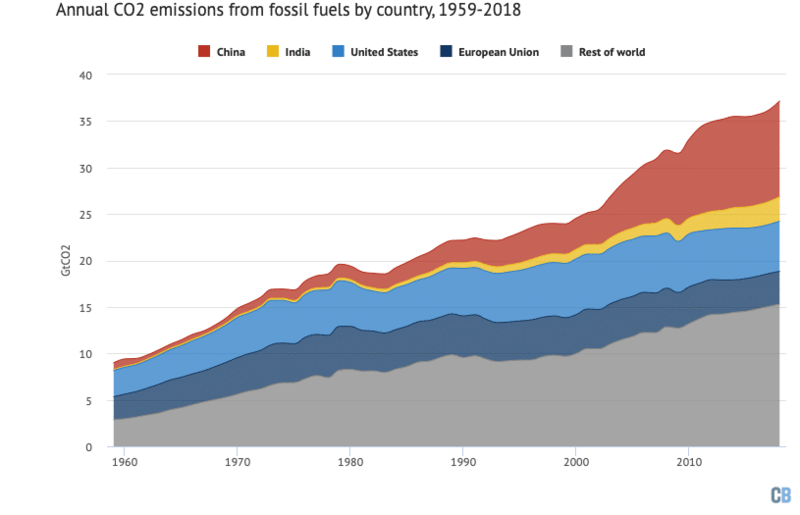 Much of the slowdown in the growth of global emissions from fossil fuels between 2014 and 2016 had been driven by a combination of reductions in the U.S. and China, as well as relatively little growth in emissions in other countries. However, in 2017 Chinese emissions grew, while declines in the U.S. slowed. In 2018 China is expected to show substantial increases in emissions, with increases also expected in the U.S.
As 2018 is not yet over–and somewhat limited data is available–these projections are still subject to large uncertainties. The GCP will publish more complete 2018 numbers in early 2019 when all the data is available. 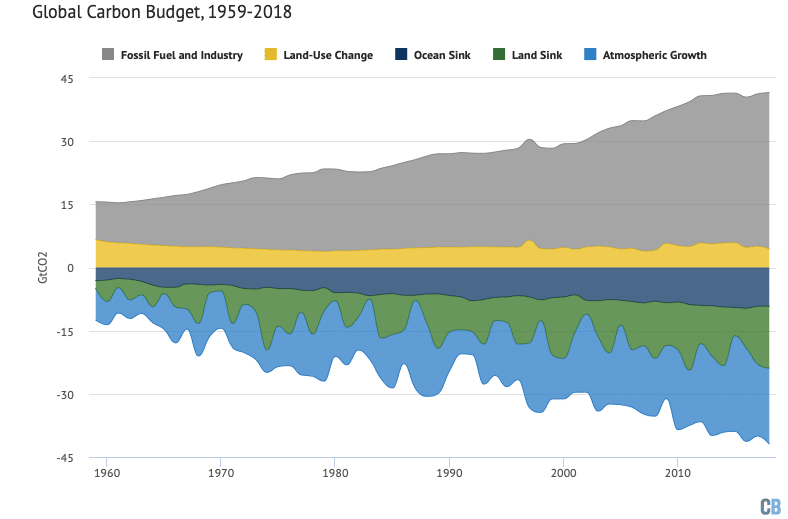 However, it is clear that the rise in emissions from fossil fuels in 2018 will be the largest in quite some time. Prof Corinne Le Quéré, director of the Tyndall Centre at the University of East Anglia and one of the lead scientists at the Global Carbon Project, tells Carbon Brief (video above) that the rise in Chinese emissions in 2018 was primarily driven by “government stimulus in the construction industry”, a sector which “emits lots of CO2”. The GCP projects that U.S. CO2 emissions are likely to increase in 2018 by around 2.5%–with an uncertainty ranging from 0.5% to 4.5%. This represents a reversal after three years of consecutive emission declines. Le Quéré points out that a large portion of the increase in U.S. emissions was “associated with a cold winter followed by a hot summer, both of which use a lot of energy”. Power sector emissions continued to decline, with U.S. coal consumption expected to reach a new low in 2018. However, these are somewhat offset by increases in industrial and transportation emissions driven by a growing economy. Despite record sales of electric vehicle in the U.S.–the total number just hit the 1m mark–there are nearly 12m more cars with internal combustion engines in the country than there were in 2008. The GCP forecasts that U.S. emissions will probably begin to decline again in 2019, as cheap gas, wind and solar continue to displace coal and temporary weather effects end. EU emissions are expected to decrease by 0.7% in 2018–with a range of -2.6% to 1.3%. While power sector emissions have continued to decrease, overall emission declines are more modest because increased use of petrol for transportation is offsetting decreased use of coal and gas for electricity generation. India’s emissions are expected to increase by 6.3% in 2018–with a range of 4.3% to 8.3%–and the rest of the world’s emissions are expected to increase by 1.8%–with a range of 0.5% to 3.0%. As Le Quéré tells Carbon Brief, “we are in a very different situation than we were in just five years ago”. This is due to very large declines in coal use in the U.S. and Europe and the rapid rise of cheap renewable energy. On the other hand, global oil and gas use is growing unabated. 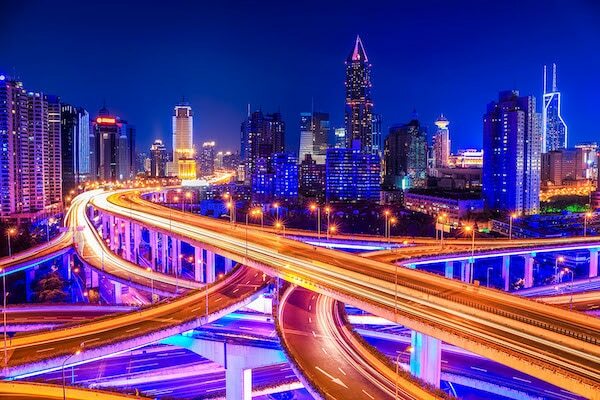 In particular, the world has been slow in addressing emissions from the transportation sector, as electric and other alternative-fuel vehicles have been slow in taking off. Le Quéré suggests that focusing on transport, buildings and industry will be critical for ensuring future emissions reductions. Insufficient emission reductions in developed countries and a need for increased energy use in developing countries where per capita emissions remain far below those of wealthier nations will continue to put upward pressure on CO2 emissions. Peak emissions will occur only when total fossil CO2 emissions finally start to decline despite growth in global energy consumption, with fossil energy production replaced by rapidly growing low- or no-carbon technologies. The most recent budget, including estimated values for 2018, is shown in the figure below. Values above zero represent sources of CO2–from fossil fuels and land use–while values below zero represent “carbon sinks” that remove CO2 from the atmosphere. CO2 emissions either accumulate in the atmosphere, or are absorbed by the oceans or land vegetation. According to the GCP estimates, about 43% of CO2 emitted in 2018 accumulated in the atmosphere. The remainder was taken up by carbon sinks–35% by the land and 23% by the ocean. Land uptake was unusually high in 2018 and one of the highest levels in the past few decades, though the cause of this is currently unclear, the authors tell Carbon Brief. Atmospheric CO2 concentration are projected to increase by 2.2 parts per million (ppm), reaching 407ppm in 2018. This increase is close to the average increase over the past decade, despite record-high emissions. This is because the return to El Niño neutral conditions and an unusally large land sink. 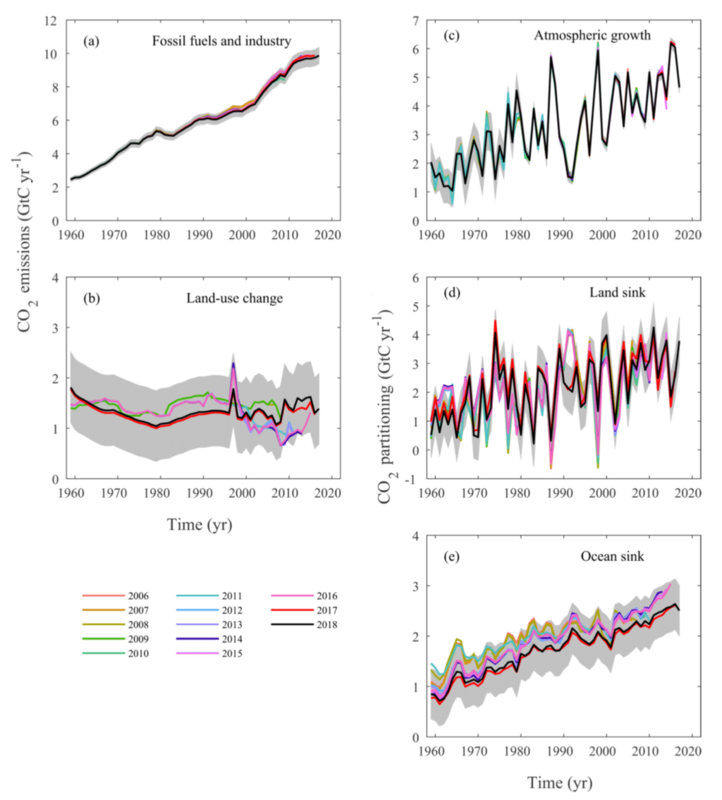 Global Carbon Project source and sink estimates in billions of tonnes of carbon (GtC)–note, not CO2–for every Global Carbon Budget published between 2006 and 2018. Figure B4 from Le Quéré et al (2018). The increase in emissions in 2018 makes it more challenging for the world to meet its Paris Agreement goals. 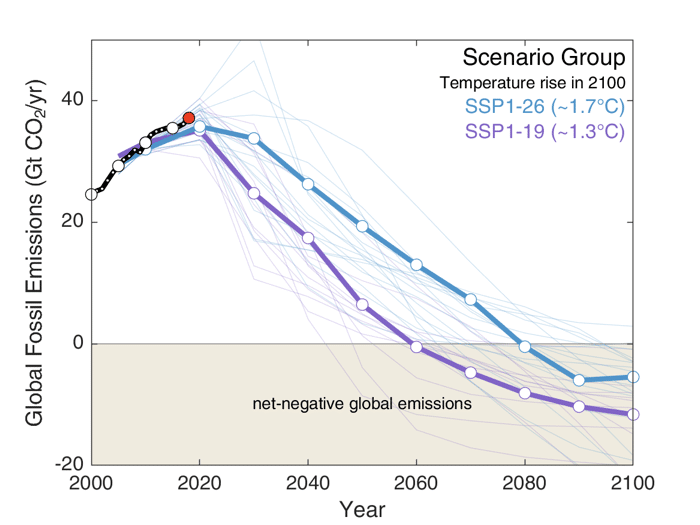 If emissions continue to increase over the next few years, the more ambitious mitigation targets–such as limiting warming to below 1.5C–may quickly move out of reach, at least in the absence of removal of CO2 from the atmosphere from planetary-scale deployments of as-yet-unproven negative emission technologies late in the century. The rise in emissions in 2017 could be seen as a one-off, but the growth rate in 2018 is even higher, and it is becoming crystal clear the world is so far failing in its duty to steer onto a course consistent with the goals set out in the Paris Agreement in 2015.